May 28-29, 1988: Excursion on Bangor & Aroostook Railroad from Bangor, Me to Fort Kent, Madawaska, and Van Buren with possible side trip to B&A yard in Canada. 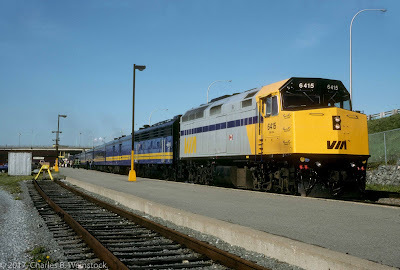 First generation diesel power with three ex-DL&W coaches. Fare is $170 which includes rail trip, lodging, two box lunches, and breakfast. Simple enough, right? Get yourself to Bangor by plane or car and ride the excursion and return home? Well not for us. In the words of Daniel Burnham, "Make no little plans; they have no magic to stir men's blood". Nor, might I add, those of little boys who still like to play with trains. The "us" in question for this trip were myself and friends Rick and Phil Moser from the Chicago area and Dave Ingles from Waukesha, Wisconsin. Looking at a map of Maine, you'll notice that Madawaska is right at the tip. In fact you can't go any further north and still be in the US. Right across the river is Edmundston, New Brunswick. Also, looking at the map you'll notice that the trip was basically a round trip from Bangor to Van Buren. This meant that if "getting the mileage" was your main goal, riding one way would be sufficient -- either boarding or "escaping" at Van Buren. 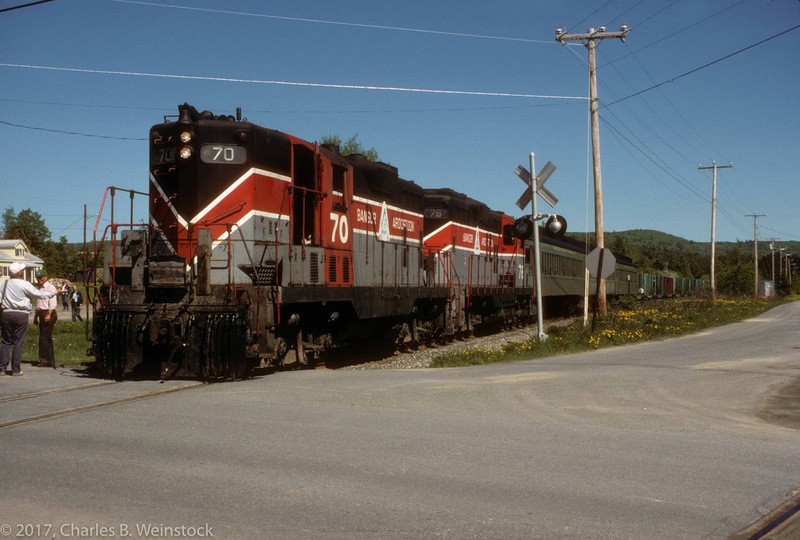 A few calls to the trip operator ascertained that this would not be possible because of border issues at Van Buren, but boarding or leaving the train in Madawaska was a distinct possibility. Riding one way gave us the flexibility to do "other things" -- the other things involving riding other trains. 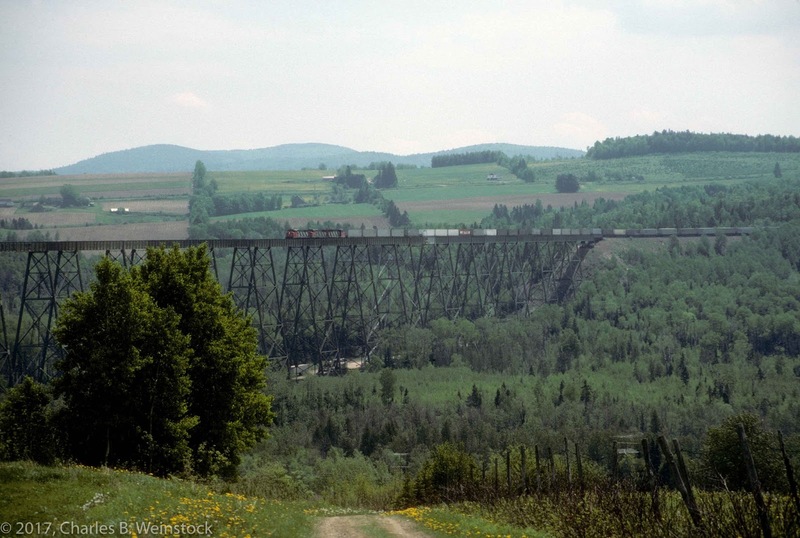 How to get to or from Madawaska? 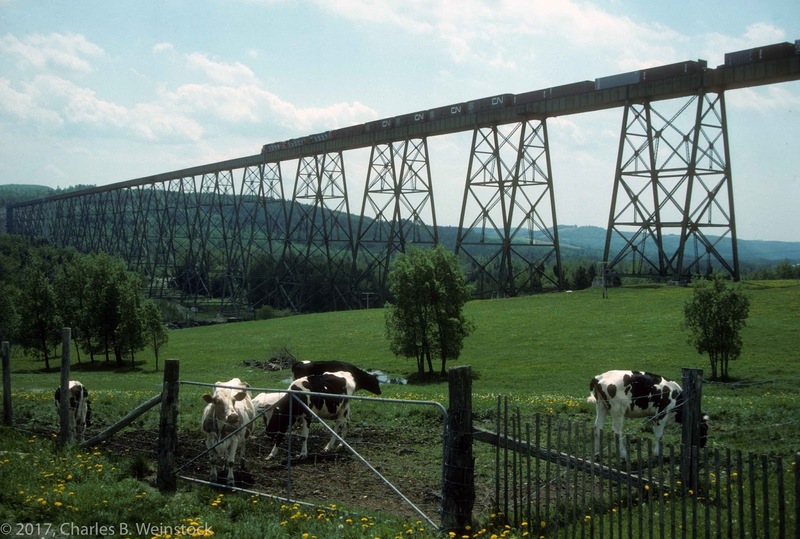 Well it turns out that Edmundston had rail service at the time. It was also where the passengers on the trip would be spending the night of May 28. Traveling with the group to the hotel and leaving from there the next morning was one possibility. Getting to Edmundston on our own, riding from Madawaska to Van Buren and return on the 28th and then riding from Madawaska to Bangor on the 29th was the other. Our decision was made for us when we discovered that an overnight stay in Moncton was necessary to get from Edmundston to Montreal, but not when getting from Montreal to Edmundston. Since the train from Moncton to Edmundston only ran on Monday, Wednesday, and Friday, that meant we needed to get to Moncton in time to catch the train to Edmundston the evening of the 27th. 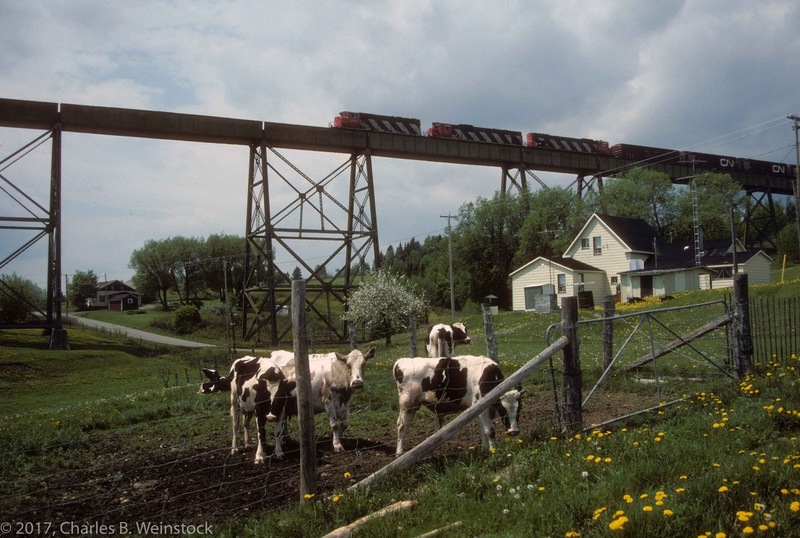 There were two trains from Montreal to Moncton in 1988. 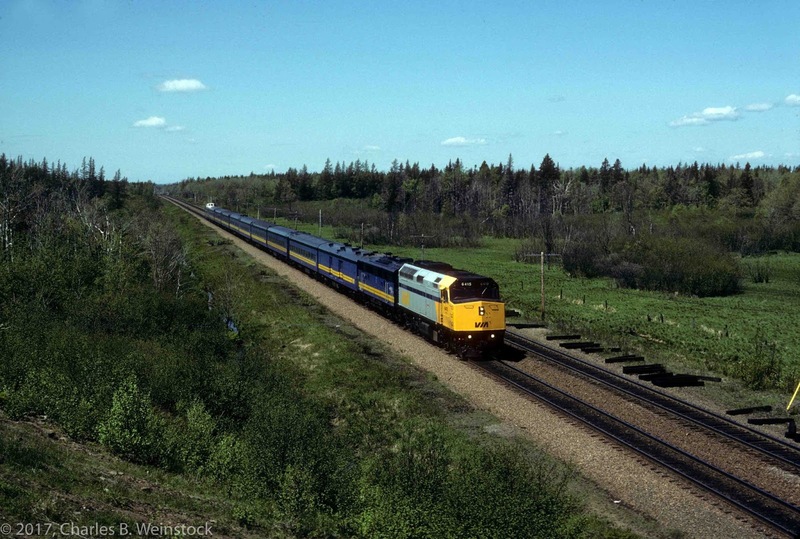 One was the Ocean (still in service today) which ran on the Canadian National route. The other was the Atlantic (annulled in service cuts in the mid-1990s) which ran on the Canadian Pacific. I flew to Montreal on May 26 (in those days you could do nonstop from Pittsburgh) and met up with Rick, Phil (who had flown in from Chicago) and Dave (who had flown in from Milwaukee via Detroit). The Atlantic left Montreal at 1840 that same day. 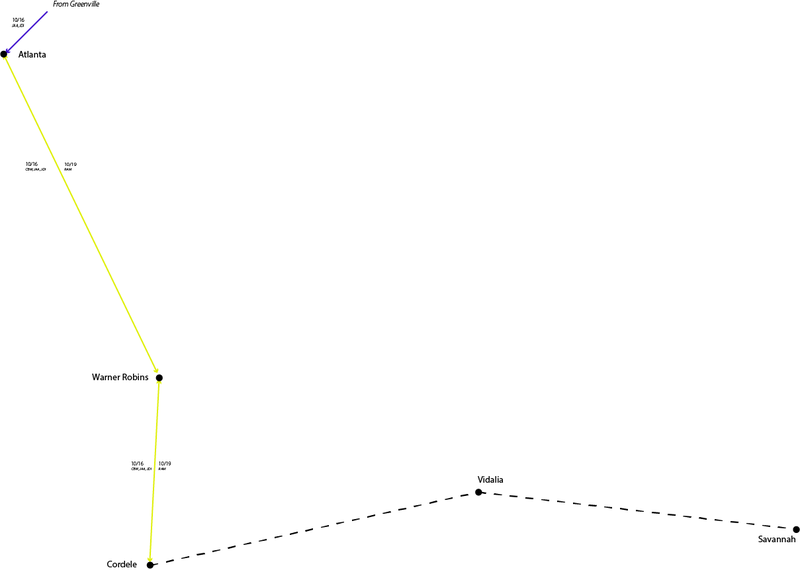 The route crossed Maine in the middle of the night, bisecting our route on the BAR at Brownsville Junction at 0245 on the 27th (assuming we were on time). By the time I awoke we were safely back in Canada and were probably approaching Fredericton Jct. at 0745. We went through Saint John, New Brunswick at 0900 (Dave's sister and brother-in-law lived there at the time), and we arrived in Moncton at 1100. 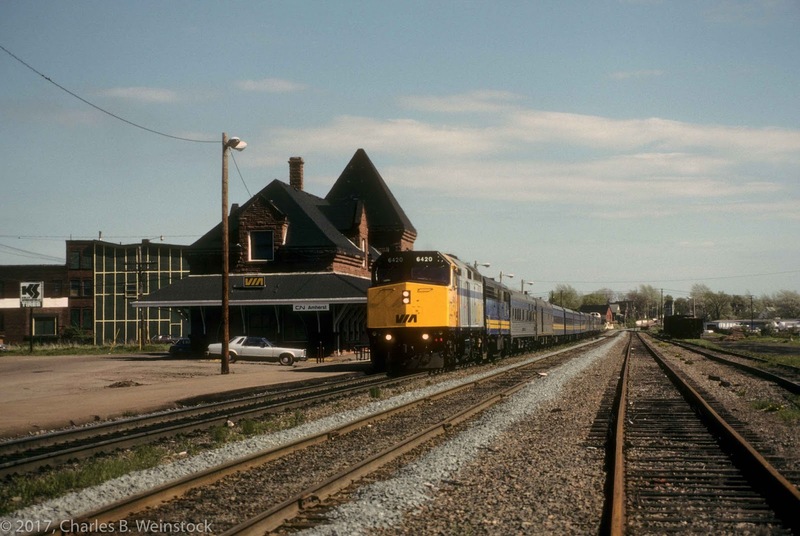 The train to Edmundston left at 1815 (arriving at 2255) giving us about nine hours to kill around Moncton. We, what else?, rented a car so that we could do some railfanning in the area. We headed off to Amherst Nova Scotia, taking pictures enroute including the westbound Atlantic. 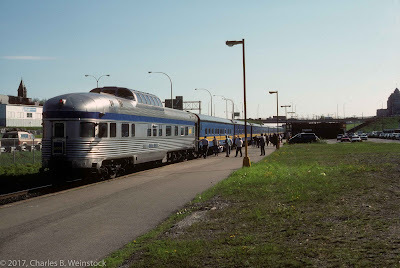 We drove back to Moncton, turned in our car, and had dinner prior to the departure of our train to Edmundston and eventual transfer to our hotel. 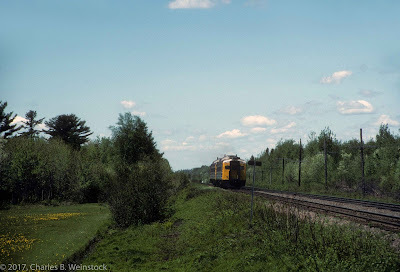 On Saturday, May 28 we had most of the day to kill before the BAR train reached Madawaska. We, what else?, rented a car and did some railfanning in New Brunswick. Coming into town the previous day we crossed a really high and long trestle east of the city (actually east of Great Falls). We dubbed this the BFB (or Big Bridge). That was one of our destinations for photography. One thing I particularly remember besides the impressiveness of the BFB was a swarm of bees nearby. I have since learned that this is the Salmon River Trestle and it is the second longest bridge of its type in Canada (the first is on the Canadian Pacific at Lethbridge--I've also ridden across it). 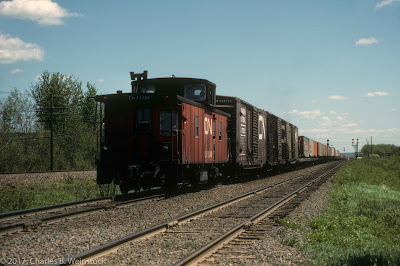 We then drove back to Edmundston and photographed trains all around the area, crossing back and forth across the border multiple times. We had lunch on the US side of the border. By the time we had crossed the border to catch the BAR train to Van Buren the border control people on both sides just waved us through. In due time the BAR train arrived, and we found seats in one of the coaches for the ride to Van Buren where the train was turned and backed out across the bridge, crossing the border. Although we couldn't get off the train on the Canadian side, we were allowed off on the US side for photo opportunities. 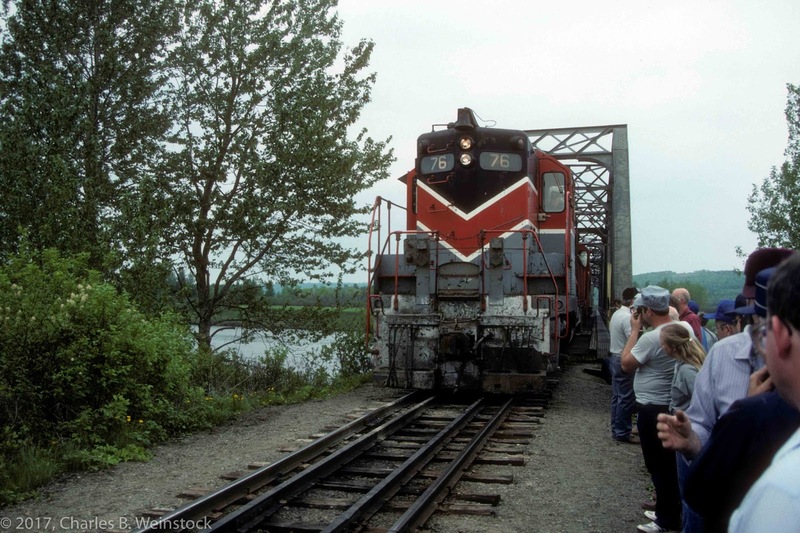 After this the train ran back to Madawaska and the passengers were transferred to the hotel we had been staying at in Edmundston. We, having a rental car, made the trip on our own. Short consist means more photos! One of the joys of traveling with the 470 Railroad Club was that the trains were small (three cars in this case) and the passengers were reasonably knowledgable. This means that it was easy for the club to set up a large number of photo runbys on the way down to Bangor giving us ample opportunity to photograph the train. 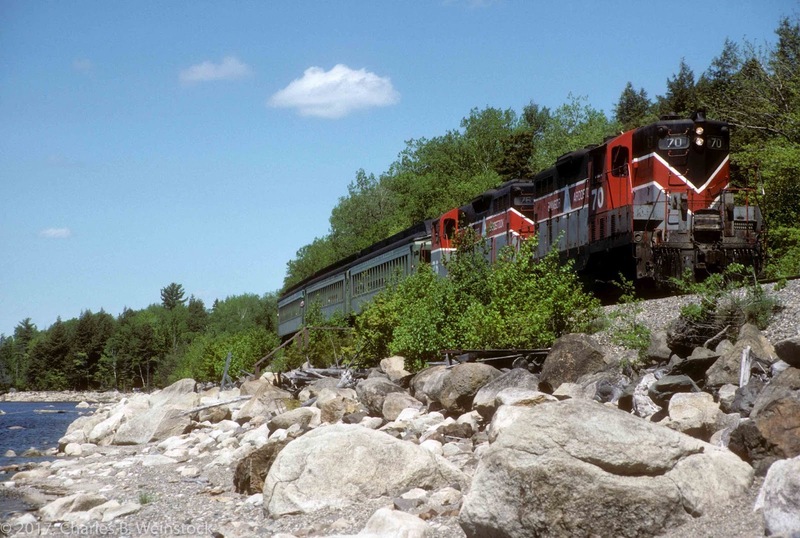 We arrived in Bangor (actually Northern Maine Junction) at 1623 and started for home. 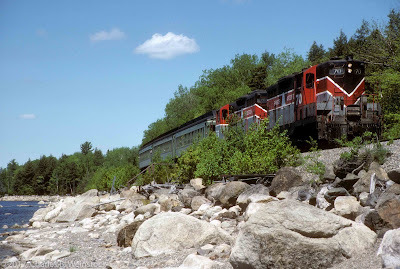 Dave was making a presentation to the Massachusetts Bay Railroad Enthusiasts in the Boston area and drove down there. I believe Phil flew home from Bangor, while Rick and I arranged to ride to Portland with another passenger, had a New England shore dinner, and flew to our respective homes the next morning. 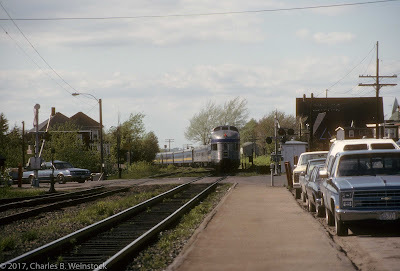 On April 27, I had dinner with friends Dave and Carol Ingles and Neil Lang at Maxims at the Depot, in the former Milwaukee Road passenger station in Oconomowoc, WI. As is often the case we talked about one of our friends behind his back. Unfortunately, the friend this time was John Arbuckle, who had been scheduled to be the fifth at that dinner, but he passed away unexpectedly of complications from a lung infection on April 15 at age 63. So instead of talking with him about many of our frequent past trips that included him, we toasted a longtime close friend lost . . . and still told stories about our trips together. One of them was really about multiple trips on consecutive weekends, in Maryland and in Georgia, and a series of complex moves only travel-weary mileage collectors could come up with, perhaps the epitome of complexity, which is saying something! 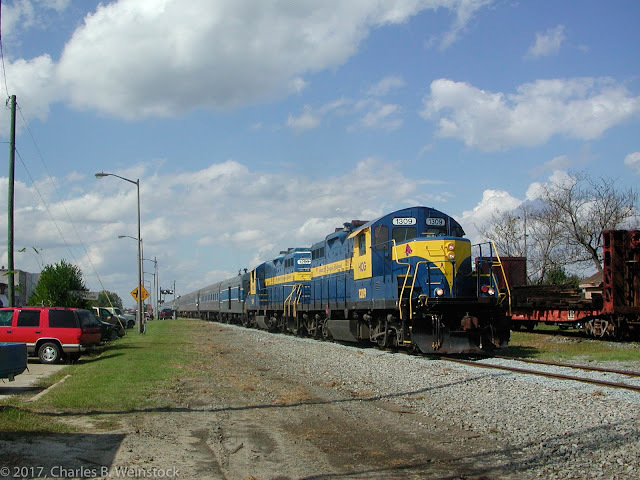 In Summer 2003, the SAM Shortline announced a three day excursion from Cordele, GA to Savannah, GA, leaving on October 17 and returning on October 19. Shortly after that, the Washington Chapter of the National Railway Historical Society announced an "Autumn Colors" excursion running on October 12 from Washington, DC to Martinsburg, WV and return. The train would go outbound via the Baltimore & Ohio's Old Main Line and would return via the normal Amtrak route. 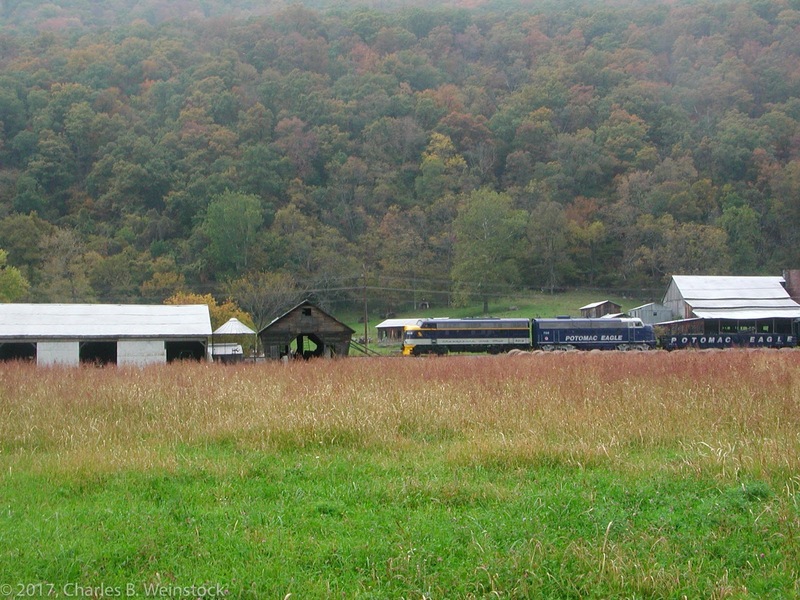 And if all of that wasn't enough, the Hagerstown Roundhouse Museum announced a "fall foliage" excursion running on October 11 from Hagerstown MD to Oakland, MD and return over the route of the former Western Maryland Railroad. The emails started flying around the internet with various people interested in various combinations of trips. When the dust settled, five of us had made plans to travel together in various combinations. The players included myself, John, Dave Ingles from the Milwaukee area, Rick Moser from the Chicago area, and the late Murrell Hogue from Texarkana. On Thursday, October 9, Dave Ingles left Milwaukee on an Amtrak Hiawatha, and transferred to the Capitol Limited to Cumberland, MD, arriving there on the morning of the 10th, late enough that he canceled a local Enterprise Rent-a-Car that he had planned to use to explore the area while waiting for me to show up from Pittsburgh. 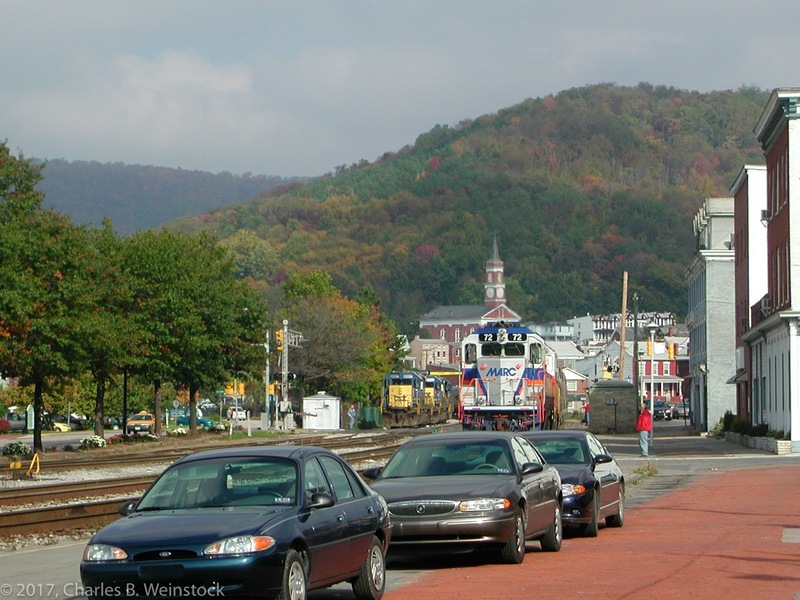 He then walked over to the nearby Western Maryland Scenic Railroad ticket office and, leaving his luggage in the ticket office, took a one-way ride to Frostburg. 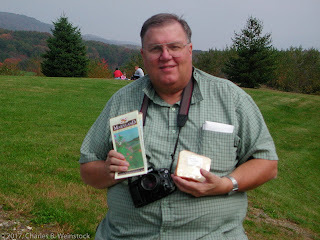 That same morning, I left Pittsburgh at 11am and drove my car to Frostburg, arriving soon after Dave did, around 2pm. We grabbed some lunch at a Wendy's, picked up Dave's luggage in Cumberland and then drove to the Hagerstown and checked into a Hampton Inn for the night. Earlier that same day, John flew from Kansas City to Baltimore arriving at about 8pm and rented a car (we'll call this car #1). I am not sure how Murrell got to Washington but he caught a MARC train from Washington to Frederick, MD (the last portion of which being a short branch I still needed at the time). John picked him up and they drove to the Hampton Inn in Hagerstown arriving after midnight. That morning we drove both cars to the Roundhouse Museum location in Hagerstown, and after making sure that our cars would not be "parked in", we boarded the train. The train left at 7:30am and was heading to Oakland, MD, but we got off at Cumberland at about 10:30am (none of us needed the mileage beyond) and, after taking some pictures of the train, walked a few blocks to a gas station to rent a Ford Taurus one-way to Baltimore (we'll call this car #2). We paid the full excursion fare and told the sponsoring group's representative what we were doing so they would not worry about us disappearing. Murrell had walked to the Western Maryland railroad station and was able to get on the sold out train to Frostburg. John, Dave, and I drove the car to Helmsetters Curve and took pictures of his train as it went past and then picked him up in Frostburg. All four of us rode in this car back to Hagerstown where we picked up my car and car #1 and caravanned all three vehicles to the Martinsburg Amtrak station. Luckily we found two occupied police cars near the station and were able to verify that we could park two of the cars overnight at the station both safely and legally. Then we all got back into car #2 and drove to Romney, WV to take pictures of the Potomac Eagle, a train that ran on the South Branch Valley railroad. From there we drove to Winchester, grabbed lunch, then to Harpers Ferry to take some more pictures, and finally to a Best Western Motel in Dorsey, MD, a suburb south of Baltimore. After a nice dinner near the motel Dave and I took car #2 over to BWI to turn it in and, after a long delay dealing with Hertz (a strong letter followed) we caught a taxi back to the motel. The five of us taxied from the motel to the nearby Dorsey MARC commuter station where we boarded the Old Main Line special from there to Martinsburg. The old main line is the original line of the Baltimore & Ohio railroad out of Baltimore, the first section of which dates back to 1830. Now freight-only except for the small portion on the west end for Frederick branch MARC trains, it joins the current main line and Amtrak route at Point of Rocks, MD. In spite of it being around virtually forever, none of us had ridden it at the time. 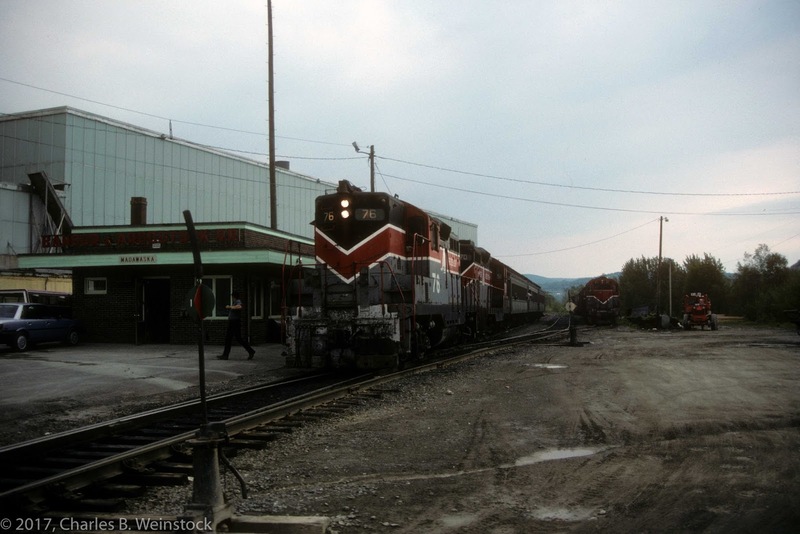 Strangely enough there were two cars waiting for us in Martinsburg where four of us detrained! (Murrell stayed on for the return trip via the current main line via Rockville.) At that point I drove home to Pittsburgh in my car (getting caught in a "Whoopie Days" parade at Berkeley Springs, WV), while John and Dave set off in car #1 on the next phase of the adventure, visiting Grafton, WV at dusk and then checking into a motel in Weston, WV for the night. 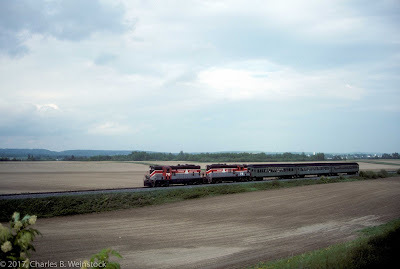 John and Dave spent the day riding the New Tygart Flyer on ex-Western Maryland trackage from Belington, WV through Elkins to High Falls, WV and then checked into an Econolodge in Elkins, WV for the evening. 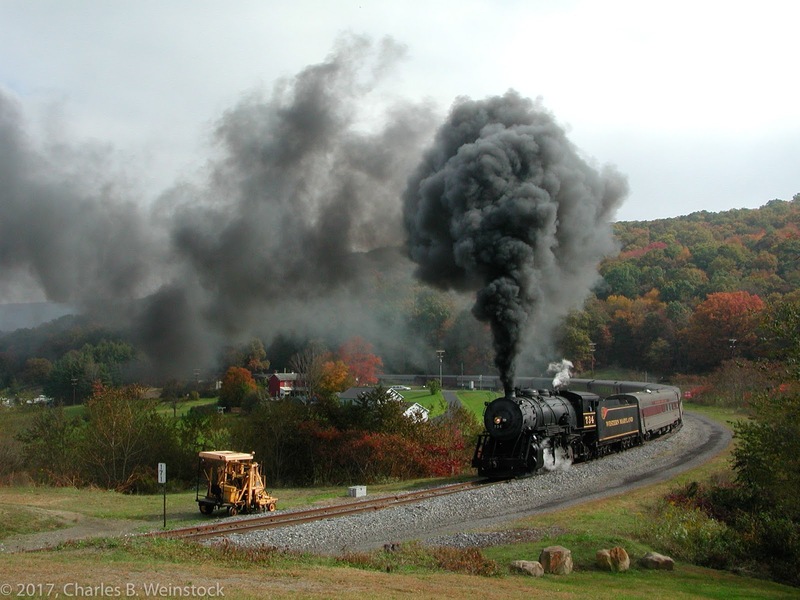 John had never ridden the Cass Scenic Railroad (in Cass, WV) a logging railroad that climbs to great heights via as much as an 11% grade using Shay (steam) locomotives. The railroad wasn't running that day, but they spent time looking around before overnighting in Lexington, VA after a stop in Clifton Forge and a visit to the C&O Historical Society’s street-front store downtown. Dave chose the Lexington motel for their free guest laundry, mid-week on his long trip. 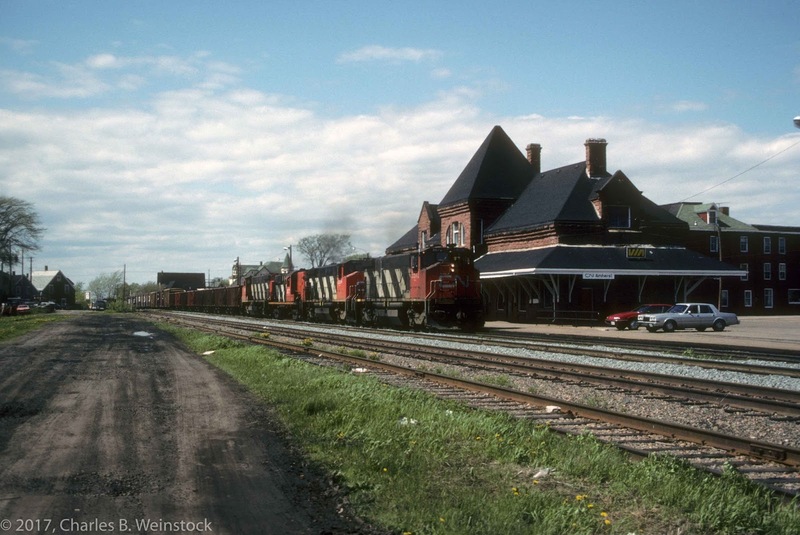 He and John found local rail artifacts (including the old C&O depot on a college campus), and were surprised at the many choices of mostly-pricey restaurants uptown, probably due to the city being home to two Universities. John and Dave spent the morning cruising the 25-mph Blue Ridge Parkway amidst blazing fall color (highly recommended) from Buena Vista to Roanoke, VA and stopped there at the railroad museum. They determined that the O. Winston Link Museum in the old N&W depot had not yet opened and after photographing a short Norfolk Southern Office Car Special that passed by, headed directly for Charlotte, NC to meet friend Jim Fetchero for dinner at a Steak n Shake, then one of few if not the only, outlet in North Carolina. They finished the day driving to Greenville, SC where they checked into a motel for the night, the objective being for Dave to watch a baseball playoff game – and speaking of rare events, it featured the Chicago Cubs vs. the Florida Marlins (Dave is a St. Louis Cardinals fan but is also an ecumenical fan of baseball). I caught a flight, presumably on USAir via Charlotte, to Atlanta and rented car #3. While I was doing this, John and Dave ate breakfast at the Greenville Steak n Shake (one of two, Dave thinks, in the state at the time) and then headed to Atlanta to rendezvous with me. Car #1 and car #3 met on an airport perimeter road to transfer luggage, etc. from 1 to 3 (try that today!) and then we drove both cars back to the rental facility to turn in car #1 (on a weekly rate). The three of us got into car #3 and drove to Cordele, GA, making a stop in Warner-Robins, GA for lunch at (yet another) Steak n Shake. We had plenty of time in Cordele that afternoon and evening and used part of it to find the next day's train in a yard west of town (took us a while) and to explore the area. Dinner was at a Cracker Barrel and we spent the night at a Hampton Inn. This motel was literally up against the CSX railroad tracks and since our rooms faced the tracks we soon found out why ear plugs were provided. John did not have this problem as he stayed at a Super 8 across the highway. The special train on the Heart of Georgia Railway (a.k.a. "HOG") was the reason why we were all in Cordele (along with a lot of our friends). We boarded the train and minutes before departure Dave said "I think I left the keys in the car". This was a problem not only because it might have lead to a stolen car, but also because we were supposed to get the keys to Rick Moser who would be riding westbound on Sunday and would then return car #3 to Atlanta on his way home. (You will recall that I mentioned Rick as a player long ago in this report. We never actually saw him, but he was part of the story!) In any event, I ran out to the car and retrieved the keys which we then gave to Carol and Thom Sulanke who were to give them to Rick prior to the return trip. The train stopped in Vidalia (yes, that Vidalia) where we were served onion sandwiches (just kidding) for lunch as part of the "Whoopie Days" going on there, and then continued on to a park near Savannah where passengers were loaded onto buses to be transported to hotels in town. However the park was about a mile or two from the connection to CSX's former Seaboard Coast Line main line and we (and another half dozen or so mileage collectors) talked the operators into allowing us to ride the HOG train to a road crosing within sight of that junction. Eventually the taxis we called picked us up at that obscure crossing and took John, Dave, and meIto a Comfort Inn near the Savannah airport. Dave was going home by train that evening but we all had a last dinner together before he called a taxi to the Amtrak station where he caught the Silver Star north. Dave's train arrived in Washington and he transferred to the Capitol Limited. I do not recall how John returned home, but presumably he caught a flight to Kansas City. I caught an early flight (6:25am) on USAir through Charlotte back to Pittsburgh. I arrived at PIT in time to meet my parents and sister off their flight from Chicago. They were coming into town for my daughter Lizzy's eighth birthday. We got to the house at 1:30pm, and that was the end of the trip for me and I presume for John as well. Rick caught an Airtran flight out of Midway airport on Saturday at 1:30pm, connecting at Atlanta to a flight to Savannah and checked into the same Comfort Inn that John and I had checked out of that morning. He met up with the Sulankes there and retrieved the car keys. On Sunday he rode the HOG train back to Cordele (with no stop in Vidalia for lunch, since "everything was closed" on a Sunday, so the return was a much quicker ride), retrieved the car from the parking lot, drove to Atlanta, and flew home to Chicago on Monday morning. Dave's Capitol Limited arrived in Chicago and he caught a Hiawatha to Milwaukee, ending his trip as well. Now, if this all doesn't explain why thinking up and executing the logistics for these rare-mileage trips are sometimes more fun than actually riding the damn trips, I don't know what does! 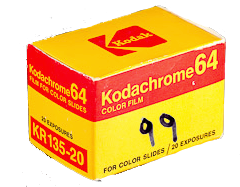 ©2014, Charles B. Weinstock. Simple theme. Powered by Blogger.